If you work for the state of Oregon and you drive an electric vehicle, can you plug in at work? Currently, the answer is "no". If you did, it could even be considered theft. House Bill 2207 will change this if it passes. It authorizes state agencies to provide electricity for electric motor vehicles. Oregon has taken several steps to encourage plug-in vehicles and this is one important detail. There has already been one case in the state with a State Park Ranger that only had enough range in his converted EV to commute one way. So he asked if he could charge at work to have enough juice to make it home. The answer was "no", despite an outlet being conveniently near his usual parking spot. His supervisor had no guidance on this issue and wanted to be "safe". You can plug in your phone, computer, or iPod, but not your car. This ranger now drives his gas car to work rather than his electric vehicle. If you have jury duty in a state court or you need to visit the DMV to register your new plug-in car, you may be able to juice up your ride on Oregon's dime. Depending on how far you have driven and how long you are plugged in, a dime may be all that it costs. 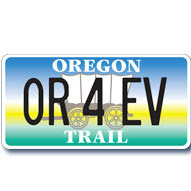 The bill justifies the expense by saying “It is the policy of the state of Oregon to encourage the use of electric motor vehicles.” So how much will this cost the state and (more importantly) we the taxpayers? There is no provision in the bill to add charging stations. It only makes plugging in not a crime. So the only cost would be for the electricity itself. The state pays less than 10 cents per kilowatt-hour for electricity and it is projected that there will be less than one thousand electric vehicles in the state by the end of 2011. There is no significant cost to this, and there is not likely to be one anytime soon. Even if the goal of 1 million plug-in vehicles nationwide by 2015 is reached, there would be no significant cost to this measure. The City of Portland has installed a few charging stations and they are giving away the electricity free with parking. However, these downtown parking spots are actually making money for the city. "How?" you ask. These spots are marked as plug-in vehicle only parking and they are a steady source of parking ticket revenue. Now I am not recommending that the state pursue a similar model. Paid parking spots are uncommon in Oregon outside of downtown Portland. This bill makes sense. No one should be prosecuted for using $0.25 worth of electricity. The state offices can turn off any outlets that become problems, were such trouble to ever arise. If this electricity helps displace gasoline use, it makes the air cleaner for all of us. This is especially important in places like a state park where you want to enjoy nature and get away from the pollution.